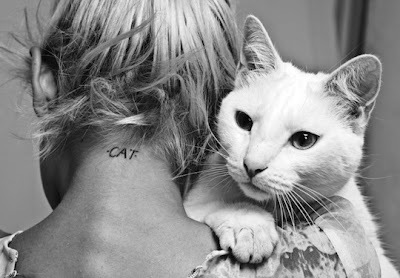 Model Anja Konstantinova really, really loves cats, but I don't think anyone would dare accuse this Russian-born beauty of being a crazy cat lady. The ailurophile recently posed alongside a regal white kitty for Australian label Stylestalker's look book for their "Baby's on Fire" collection, and was able to release her inner feline by wearing cat ears, and displaying some of her cat tattoos. In a behind-the-scenes interview from the shoot, Anja reveals that she has three cats of her own, and is often told she must have been a cat in her past life. She also proudly shows off her four "cattoos," which include the word "Cat" on her neck, "Cat" in Russian on her arm, "MEOW" written on her inner bottom lip, and a Baby Phat-esque kitty on her side. Check out some images from the shoot below, and a few more over at Fashionista. what is the breed of this white cat?